E-commerce is booming – online commerce is expected to reach ….. While merchants like Amazon have got a lot of things right, there are others who continue to struggle in this growing market. While there are a number of best practices that you can follow, there is no magic formula that can guarantee success. It all boils down to understanding your customers and doing everything to meet them has spoken and unspoken demands. Have you ever wondered who your customers are? Why they shop online? And What are their top concerns that prevent them from placing an order? Product Discovery – How do I find the right Product? Shopping Experience – Is it too difficult to shop on this e-commerce store? Different customers have different expectations and have to be dealt with accordingly. Before we identify ways to address these concerns, it is important to understand your customers first. The basic understanding of the modern consumers is drawn based on the most preferred touch points and customer experiences while shopping on e-commerce sites. These are based out of surveys conducted by marketing giants like Hubspot, BigCommerce, Square, Harvard Business Reviews etc. The demographic, physical and psychological parameters play a role in making a buying decision. For example, a grandfather looks for a branded watch for his son based on the features, warranty, and quality that watch provides. Whereas, the grandson looks for the style and brand value. Our article will help you concentrate more on your customer’s wants and wills based on the above parameters. As customers are increasingly shifted their purchasing habits to online, the e-commerce industry tends to grow intensely. It is for you to look big yet simple to implement. 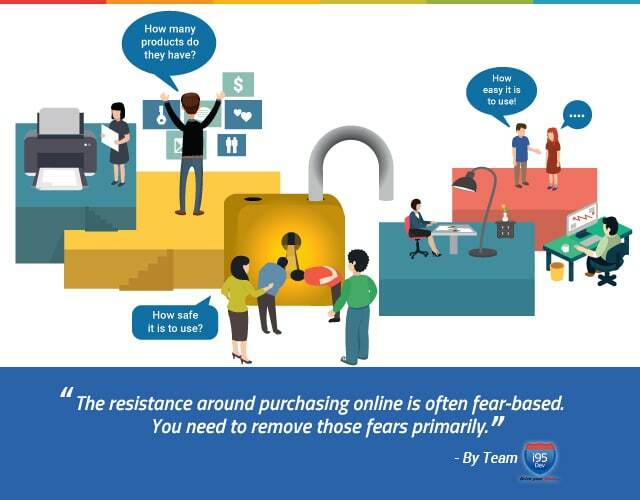 Check out the infographic giving you the insights on online customer shopping trends as mentioned above more precisely. 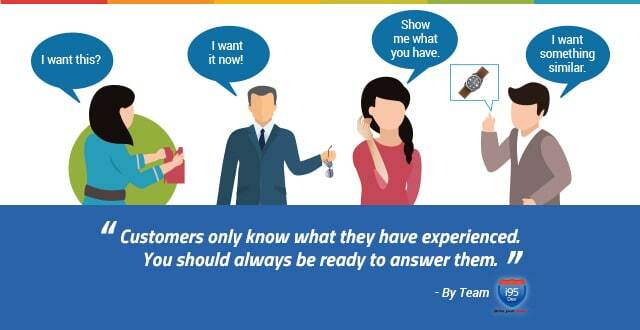 It’s high time to change your tone to match your customer’s needs. Check out Online customer insights. All you could do is to marvel at your online Store to match the diverse customer needs. Check out now. What are the top 3 customer concerns? 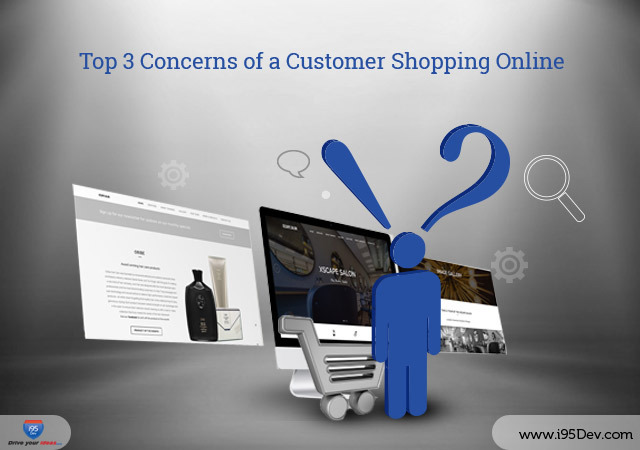 Let us now analyze the top 3 concerns mentioned above to these types of customers in general. 67% of millennials look for high-class brands and designer items. 56% of Gen-X rely on look and feel of the product on them. 41% of baby boomers look for product features and reviews mentioned. 28% of seniors citizens look for worried about warranty, return policy, quality, features, usages, and manufacturer. The Millennials look for specified products. They mostly prefer uniqueness of products. Hence they want to see the product features. They often follow social media in order to get discounts. The Gen-X are quite impressed with those e-commerce sites which are mobile optimized. They look for attractive stylish products. For example, an eyeglasses online store called Warby Parker comes up with a unique feature of suggesting a suitable eyeglass to appeal to this crowd. The Baby Boomers are curious to know about the trends. They want to prove to themselves that they are no less than the younger generation. So, they actively participate in e-commerce sites to shop for their next generation and surprise them. 20% of the American public are baby boomers. They follow social media to know the trending brands. The Gen-X want instant gratification, order tracking, return policies and offers. The millennials, seniors and baby boomers look for 2-step verification, return policy, tax, delivery & shipping policies. They look for discounts, product reviews, and referral bonus. The parents in-general prefer to shop online for their kids at least 2-3 times in a month. They say 49% of the kids wear, toys, video games and other household products are bought from the e-commerce site. On the other hand, the parents want their kids to be special at every occasion of life. They want to see their kids as queens and kings. They want to give the best out of the best. Among parents Mothers spend a lot online buying households. 51% of non-parents spend their time online for buying household items. B. They are quite busy in taking care of their professional careers. They have limited time to spend on each other. So, they are couple considering shopping as the quality time to spend with each other. Both Parent and non-parents prefer looking at reviews given by others. They prefer to read the product description, features etc. Parents and non-parents rely on Budgets and Mobiles. They spend at-least (7- 9) hours in a week shopping online. Parents multi-task, so make it easy for them to access your website on any device they use. They follow their own terms and conditions on their feasible time. Non-parents follow social media to get discount coupons and visit the nearest store to redeem them. Security is the biggest concern for Parents. Parents who shop on mobile tend to save their sensitive data on shop cart. They prefer having a 2-step verification and an order tracking status. Non-parents slightly visit the physical store. They consider shopping as a form to spend quality time. They want the variety of products. 30% of men started looking for the attire specific online store. 37% of male shoppers check social networks for comparison shopping. They are overwhelmed if the online store is personalized for them. They look for specific body types and suitable. A customized approach towards answering their needs improves their trust towards the brand. Return and refund, timely delivery is the only major concern for all these people. Urban, when they find a delivery policy that can be delivered in just a few hours of their order, they consider the online shopping as the best. It is, therefore, large retailers are now implementing same day delivery, Online to Offline ( O2O) is another trending model that urban are attracted to. Rural look for free shipping options while shopping online. Urban look for the creative stuff mentioned in the online store that is more attractive enough to drag them to a physical store. 38% of rural shoppers say online privacy is their major concern. 63% of urban shoppers do not prefer to pay shipping costs and if they tend to shop, the price is the biggest concern for them. How to address these customer concerns? Maintaining a strong online presence is not only the best way to engage with customers. You need to satisfy the needs of these diverse e-commerce customers who are just and only online. You should allow them to search for themselves what they want in your e-commerce site. Most of the customers of e-commerce prefer everything just at the end of the hand palms. A responsive website theme like Magento can give highly effective device based optimizations and best browsing experiences. “79% of shoppers will avoid shopping again at a site where they had a poor experience or that was too slow”. Customer-centric content and promotions elevate their shopping experience. Navigating omnipresence shopping experience (read our blog on omnichannel experience) allows them to penetrate through different means of buying researching channels. Use the information you have about buyers to personalize your outreach to fit their interests. We, at i95Dev, understand the online revolution you want to bring through your website. Hence, we understand your industry and your customers first. We analyze your present state of business and online presence you have. All these details help us in drawing a demo of improvements and suggestions. Feel free to drop an email info@i95dev.com. We are Magento certified online store development agencies with offices in US, Australia, and India. Next blog: Top 3 website designing tips to address these customer concerns.